El Se�or de los Cielos is an American 60 minute scripted thriller television series, which kicked off on August 18, 2013, on Telemundo and is broadcast every Monday at 22:00. The show is currently in its 6th season. Telemundo is yet to announce the renewal of El Se�or de los Cielos for Season 7 as well as its cancelation. Sign up to track down the show's status and its release date. Aurelio Casillas is about to claim his place as Mexico's wealthiest and most powerful kingpin since the notorious Pablo Escobar. 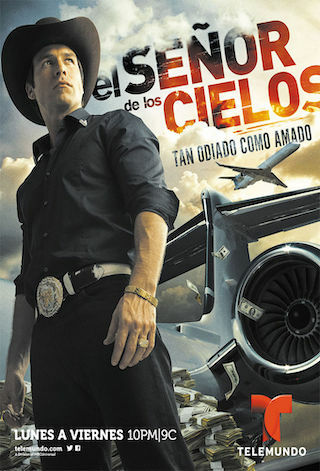 Armed with ruthless ambition and animal-like instincts, Aurelio outsmarts the law and, most importantly, his cartel rivals with a fleet of drug smuggling airplanes  earning him the nickname El Señor de los Cielos (The Lord of the Skies). But when revenge-seeking Special Forces police officer Marco Mejía demands personal retribution, Aurelio's guarded anonymity and rising empire fall under attack. The two men plunge into a life-or-death battle of drugs, raw passion, and betrayal that can only end in blood. Inspired by true events, the smash hit El Señor de los Cielos uncovers the looming dangers of the drug underworld in an action-filled drama.